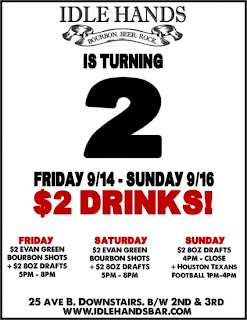 Bright Lights, My City: Celebrate The 2nd Anniversary of Idle Hands Bar! plus the Battle Of Los Angeles After-Party! And while you’re boozing on the cheap, celebrate That Burger’s one year of burgerin' inside Billy Hurricanes and Idle Hands Bar by getting down on their burgers and tots! Idle Hands Bar. 25 Avenue B. Downstairs.